In his seventh year, Neville isn’t worried about grades or making friends. That Hogwarts is gone. The only important thing now is survival. One way or another, he’s going to find out what it takes to lead an army. In a world ruled by shadows and fear, Daphne Greengrass crafts herself the mask she needs to survive. During the nightmarish year when Professor Snape is Headmaster of Hogwarts and the Professors Carrow conduct their reign of terror, the annual Hallowe'en feast, once a source of innocent fun, becomes an evening of horror. Is it really a prediction of an unimaginable future? Nothing can be depended upon anymore. It's the final year before the Battle of Hogwarts, and Ernie Macmillan and Hannah Abbott are forced to grow in ways they had not expected, to protect themselves and their fellow Hufflepuffs from the evil that has permeated Hogwarts. The Ministry has fallen. Families are destroyed. Students are on the run. In the midst of Voldemort's reign of terror, Ginny Weasley returns to Hogwarts. Neville Longbottom knew before he left for his seventh year at Hogwarts that things were going to be different. He just didn't realise quite how different that would be. She's a Muggle-born rebel who needs to be a conformist. He's a pureblood conformist who wants to be a rebel. They're an unlikely team, but helping each other is essential if they're going to make it through Voldemort's new regime alive. When survival comes at a cost, the safest place to hide is behind enemy lines. by the Dark Lord's rise to power and the mortal peril they face. until treachery becomes the price for staying alive. Where's the new world that would rise up after the war? Where's the idealistic views we all had of a post-Voldemort Great Britain? Why do I still sit here, sipping an almost empty glass just to see you smile? Does anything ever change? Written in 2010 for Inti's Pretty People challenge at TGS, LindaSnape's T.S. Eliot challenge on TGS and maskedmuggle's What Happened challenge on HPFF. Anthony has always loved celebrating Hanukkah with his family. This year, with war darkening the world around him, he finds new meaning in the festival of lights. Lovely banner by victus. @ TDA! "Jumping jarveys!," Ernie MacMillan shouted as Colin's counterjinx sailed through the air and crashed into Harry. Silence followed as he flew through the air. 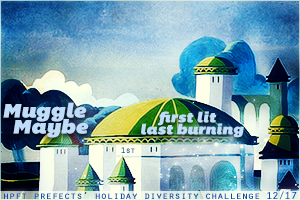 Fantastic Banner by Kirjava @ TDA! Ernie MacMillan and his family have been targeted for revenge, but they have no clue why. Will Ernie be able to figure out who's attacking him and why before it's too late? It's been 5 years since the war ended and the wizarding world is finally starting to heal, but quiet whispers of a militant group attacking Pureblood families threatens that peace. When Pureblood families start to disappear, the Trio gets dragged in to help.